Is your organization using email to raise money? I’ve made no secret of the fact that I believe email marketing can level the playing field for small nonprofit organizations. All of the major studies point to a continued rise in online giving. Convio’s Online Marketing Nonprofit Benchmark report revealed that online revenue increased by nearly 16% in 2011. Small nonprofits fare best, with Convio’s report showing a 26.8 percent increase for organizations with less than 10,000 email addresses. 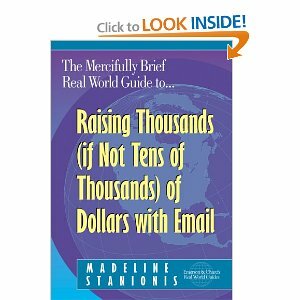 If you’re a small shop fundraiser and you’re looking to raise serious money online, The Mercifully Brief, Real World Guide to Raising Thousands (If Not Tens of Thousands) of Dollars With Email by Madeline Stanionis could well be the only book you’ll need. If you think that nonprofit email is all about blasting your Outlook contacts with a mass email, think again. While email is relatively cheap (in comparison with direct mail) and has a reputation of being easy, Stanionis doesn’t shy away from the fact that “it’s in the list” (sing it to the tune of “It’s in his kiss”). Email marketing is, as Madeline points out, “a numbers game,” and growing your email list needs to be at the forefront of your strategy for raising money online. She shares tips you can incorporate year-round for bringing in new names, including quizzes, giveaways and contests. What else? It helps to know that email is ephemeral. Stanionis reminds us that “you must send the right message to the right person at the right time.” On the other hand, with email if the first time was the wrong time, the next time may well be the right time. Typical of Emerson & Church books, The Mercifully Brief, Real World Guide to Raising Thousands (If Not Tens of Thousands) of Dollars With Email presents a topic that might be intimidating to the novice fundraiser in a fresh, succinct, easy-to-follow manner. You’ll come away with a solid understanding of the medium, and a roadmap to your next campaign.